These Terms of Service (the “Terms”) govern your use of the Naviance platform (the “Service”). The Service is owned and operated by Naviance Inc., a subsidiary of Hobsons, Inc. (“Hobsons”). By using the Service, you are deemed to have entered into a binding agreement with Naviance whereby you shall abide by these Terms and any accompanying Order Form (collectively, the “Agreement”). For purposes of clarity, any Order Form to which these Terms are attached or in which these Terms are referenced is deemed to incorporate these Terms. If you have entered into this Agreement on behalf of an educational institution (an “Institution”), you represent that you have the necessary authority to bind that Institution to this Agreement. If you do not have the necessary authority, or if you do not agree with any of these Terms, then you may not use the Service. Any use of the Service in violation of these Terms is unauthorized and is expressly prohibited. As used in this Agreement, (i) the term "Customer" refers to the Institution and its officers, directors, agents, and employees, and (ii) the term "User" refers to a student, a student's parent(s) or legal guardian(s) and/or a person who registers for the Service through an account provided by Customer. 1. Scope. The Service is a web and mobile-based college and career readiness platform that helps students explore goal setting, academic planning, career exploration, and college and related post-secondary education preparation and planning. The Service also helps to identify and facilitate student connection with higher education institutions and scholarship providers that are of interest, while simultaneously operating as the system of records for Customers. Many core features of the Service may be activated solely at the discretion of Customer. The Service also includes a browser interface and data transmission, access, storage (subject to commercially reasonable limits as may be imposed by Naviance in its sole discretion) and single sign-on capabilities. Customers and Users are responsible for their own Internet connection, communications and computer costs. 2.1 Matching Features. The college planning function contained in the Service includes certain optional features (collectively, “Matching”) that allow students to view information from and interact with Hobsons’ higher education Intersect subscribers (“Higher Education Institutions”). Matching is inactive by default, and therefore must be enabled by an authorized representative of Customer who has obtained consent from the student’s parent or legal guardian prior to the activation of Matching. Matching may be turned on or off at any time at the sole discretion and control of Customer. RSVP to upcoming events hosted by Higher Education Institutions. If a student expresses interest in a nonprofit Higher Education Institution, that student will receive an invitation through the Service to connect directly with the Higher Education Institution. The student may then choose either to disregard or to respond to the invitation. No student or Customer information is shared with any Higher Education Institution unless Customer has enabled Matching and the applicable student has explicitly opted to send his/her information directly to the Higher Education Institution. 2.2 Third Party Features. Customer may choose to activate and/or purchase features and services within the Service that are provided by third party service providers. All such third party features and services are inactive by default, and must therefore be enabled by an authorized representative of Customer. Such features and services may be turned on or off at any time at the sole discretion and control of Customer. Certain third party services are included with the purchase of the Service while others must be purchased separately, and may be subject to additional terms and conditions from Naviance and the applicable third party service provider. The liability of Naviance to Customer or any User for or in connection with any such third party services shall be limited to the amount of fees paid to Naviance by such Customer for such third party services less any amounts paid by Naviance to such third party service provider for such third party service. 2.3 Credit Card Processing. Where applicable and necessary for additional purchases from an authorized representative of Customer, Naviance shall engage the services of third-party intermediaries to provide credit card processing services to Customer. Such intermediaries are solely links in the distribution chain and are prohibited from storing, retaining, or using the information provided, except for the sole purpose of credit card processing and/or as otherwise required by law. Before Customer submits credit card information, Customer must agree to any applicable third-party intermediary’s terms of service and privacy policies including, without limitation, provisions on limited warranties and liability. The Service may contain discussion forums in which Customers may post reviews of, make recommendations for, or give ratings for content, events, products, services or third-party providers, or post other content, messages, materials or other items ("Interactive Areas"). Interactive Areas are not accessible to Users. Interactive Areas include Intersect by Hobsons, which allows Customers to edit their school profiles, interact with college admissions counselors, and manage college visit scheduling. Access to Intersect shall be subject to separate Terms available here. Customer is solely responsible for Customer’s use of such Interactive Areas, and acknowledges and agrees that Naviance may set up any such Interactive Area to be accessible by all Customers or by certain Customers selected in Naviance’s sole discretion. 2.4.1 No review, recommendation or rating of any matter or service provider within the Service or in any Interactive Area shall be deemed to be an association with, sponsorship of, or an endorsement by Naviance of any the particular matter or a guarantee of any service provider's quality, competency, qualifications, experience, resources, character, honesty, integrity, responsiveness or other personal and professional characteristics. 2.4.2 Naviance takes no responsibility and assumes no liability for any content posted, stored or uploaded by any Customer or any third party in any Interactive Area, or for any loss or damage related to or resulting from Customer’s or any other person’s use of any Interactive Area, nor shall Naviance be held liable for any mistakes, defamation, slander, libel, omissions, falsehoods or obscenity Customer may encounter in any Interactive Area. Although Naviance has no obligation to screen, edit, or monitor any of the content posted to or distributed through any Interactive Area, Naviance reserves the right, and has sole and absolute discretion, to remove, screen, or edit without notice, any content posted to any Interactive Area at any time and for any reason, and Customer is solely responsible for creating backup copies of and replacing any material that Customer posts or stores in any Interactive Area at Customer’s sole cost and expense. 3. Service Fees and Payments. Customer’s access to and use of the Service shall be subject to certain fees set forth the Order Form. Customer will pay all fees in accordance with the billing terms in effect at the time a fee or charge is due and payable to Naviance, as noted in the Order Form. Service fees are non-refundable whether or not Customer uses the Service. 3.1 Billing and Renewal. Fees for the Service are payable to Naviance in advance. Except in the event that Section 3.4 below applies, Naviance will notify Customer of the opportunity to renew the Service approximately thirty (30) days prior to the subscription expiration date. Service fees are exclusive of all taxes, levies, or duties imposed by taxing authorities, and Customer shall be responsible for payment of all such taxes, levies, or duties as may be applicable to the Service fees (exclusive of any taxes or similar fees that may be imposed on the net income of Naviance). 3.2 Billing Information. In all cases, Customer shall provide Naviance with complete and accurate billing and contact information. This information shall include, without limitation, legal name, street address, e-mail address, name and telephone number of an authorized billing contact. Customer agrees to update this information promptly following any change thereto. Customer may opt to purchase additional, optional features by request, and subject to additional terms. 3.3 Fee Changes. Naviance reserves the right, in its sole and absolute discretion, to change the fees, applicable charges and usage policies and to introduce new charges at any time, upon at least thirty (30) days prior notice to Customer; provided, however that such fees shall not become effective for Customer for services then in effect on Customer's account until the next renewal period for Customer's account. If Customer has agreed to automatically renew the Agreement in accordance with section 3.4 and a schedule noted in the Order Form, fee changes noted in 3.4 or the Order Form will apply. 3.4 Autorenewal. In the event that Customer has purchased Naviance through an autorenewal process, this Agreement shall automatically renew unless Customer provides Naviance with written notice of its intent to cancel not fewer than thirty (30) days prior to the autorenewal date, which shall be the one (1) year anniversary of the subscription date, and on each annual anniversary date thereafter. Service fees will increase by no more than five percent (5%) annually. Written cancellation requests will be honored only at the end of the one (1) year anniversary date of the subscription. 3.5 Non-Payment and Suspension of Service. Customer’s account will be considered delinquent if payment in full of the amount set forth on an invoice is not received within thirty (30) days following the date of the applicable invoice. Naviance reserves the right to suspend or terminate this Agreement and Customer’s access to the Service if Customer’s account becomes delinquent. Payments not received by Naviance within thirty (30) days following the date of the invoice shall bear interest at a rate equal to one and one-half percent (1.5%) per month on any outstanding balance, or the maximum permitted by law, whichever is less, plus all expenses paid by Naviance for the purpose of collection. Customer will continue to be charged during any period of suspension. Customer agrees that Naviance may charge unpaid fees to Customer’s credit card, if applicable, or otherwise bill Customer for unpaid fees. Naviance also reserves the right to impose a separate reconnection fee should Customer request access to the Service once outstanding fees have been paid. 4. Naviance Ownership. As between Naviance and Customers/User(s), Naviance owns all right, title and interest, including all related copyright, patent, trademark and other intellectual and proprietary rights (collectively, "Intellectual Property Rights"), in and to the Service and shall have any and all proprietary rights in, without limitation, any suggestions, ideas, enhancement requests, feedback, and recommendations provided by Customer, Users, or any other party relating to the Service. For purposes of clarity, this Agreement is not a sale and does not convey any rights of ownership in or related to the Service or Intellectual Property Rights owned by Naviance to Customer or Users other than as expressly set forth herein. Naviance® is a registered trademark, and the Naviance logo and product names associated with the Service are trademarks of Naviance or third parties, and no right or license is granted to use them other than as expressly set forth in this Agreement; provided, however, that Customer may link to the homepage of the Naviance website located at www.naviance.com or to the Service from another website, for the purposes of directing Users to the website or the Service and that such link may include the Naviance name and relevant product name(s). Customer may not frame any page of a Naviance website. 6. Customer and User Responsibilities. Customer is solely responsible for any and all activities that occur under or in connection with Customer's and its Users' accounts. Customer and Users shall: (i) maintain the confidentiality of account names and passwords; (ii) notify Naviance immediately of any unauthorized use of any password or account or any other known or suspected breach of security; (iii) report to Naviance immediately, and stop immediately any use of the Service that is inconsistent with the terms of the License provided in Section 5 that is known or suspected; (iv) assure that use of the Service shall at all times conform to the terms and conditions of this Agreement; and (v) not impersonate or attempt to impersonate another Customer or User or provide false information in an attempt to gain access to or use the Service. In the event that a User makes any attempt to gain unauthorized access to another User’s or Customer’s account, or to view or manipulate the records of another User or Customer, Naviance reserves the right, in its sole discretion, to terminate the Agreement with the User and/or applicable Customer, and inform any relevant authorities of such violation. 7. Account Information and Data. Naviance, on behalf of itself, its employees, consultants, subcontractors and third parties assisting Naviance in providing the Service, and Customer each represents, warrants, and covenants that it complies with, and will comply with, all applicable federal, state and international data protection and privacy laws and regulations with respect to the personally identifiable information collected, stored and maintained through the Service, as well as with all applicable business regulations. Naviance may disclose Customer or User information if necessary in order to comply with subpoenas, court orders, or regulatory requests, to protect Naviance's systems and customers, or to ensure the integrity and operation of Naviance's business and systems. When legally permissible, Naviance will notify Customer in advance of such disclosures and reasonably cooperate with Customer to limit the scope of such disclosures. 7.3 Children's Online Privacy Protection Act ("COPPA"). Without limiting the generality of Section 7 of this Agreement, in the event that Customer allows Users under the age of 13 to submit personal information as defined in the Children’s Online Privacy Protection Act (COPPA) to Naviance in connection with its use of the Service, Customer agrees that it will be responsible for obtaining verifiable parental consent prior to making the Service available to such Users. Naviance shall fully comply with COPPA and any rules or regulations promulgated thereunder. 7.4 Security. Naviance implements, maintains and updates, as appropriate, reasonable security policies, procedures and practices as dictated by the nature of the personally identifiable information collected and maintained through the Service, in order to protect such information from unauthorized access, destruction, use, modification or disclosure. The Service has security measures in place to help protect against the loss, misuse, and alteration of Customer and User personally identifiable information. When the Service is accessed using a supported web browser, Transport Layer Security (TLS) technology protects information using both server authentication and data encryption to help ensure that data are safe, secure, and available only to authorized users. Naviance also hosts the Service in a secure server environment that uses a firewall and other technologies in an effort to prevent interference or access from outside intruders. Data is secured at rest using storage level encryption. The Service also require unique account identifiers, user names, and passwords that must be entered each time a Customer or User signs on. The Internet, however, is not perfectly secure and Naviance shall not be responsible for security incidents not reasonably within its control. 8.1 Term of Service. Unless otherwise set forth on the Naviance Order Form (“Order Form”), this Agreement commences on the date of Order Form execution ("Effective Date") and shall continue for the term set forth on the Order Form (the “Initial Term”), unless terminated earlier by either party pursuant to this Agreement. In the event that Customer has purchased the Service through an autorenewal process, this Agreement shall automatically renew thereafter for consecutive one (1) year terms (each, a “Renewal Term” and, together with the Initial Term, the “Term”) unless Customer provides Naviance with written notice of its intent not to renew not fewer than thirty (30) days prior to the conclusion of the Initial Term or the then-current Renewal Term. 8.2 Termination for Cause. Naviance may terminate this Agreement in its sole discretion if Customer has breached any term of this Agreement and fails to cure such breach within fifteen (15) days following receipt of written notice from Naviance thereof. 8.3 Data Retention. As soon as practicable upon expiration or termination of this Agreement, but in any event no later than six (6) months after expiration or termination, Naviance will delete personally identifiable student information. Notwithstanding the above, Customer may, at any time and in its sole discretion, request in writing that its personally identifiable student information be deleted, and Naviance shall comply with any such written request within thirty (30) days. Naviance has no obligation to retain Customer Data if Customer or User has materially breached this Agreement and such breach has not been cured within fifteen (15) days following receipt of written notice of such breach from Naviance. Naviance has no obligation to retain Customer Data if the account is delinquent, and such Customer Data may be irretrievably deleted. Under all circumstances, within a reasonable time frame prior to deletion of student personally identifiable information, Naviance will notify Customer so that Customer may utilize functionality within the Service to export its data. Notwithstanding the above, if Naviance provides accounts for student users, Naviance may transfer a copy of records created by or otherwise available to a student into their individual account. 9. Representation, Warranties, and Covenants. Each party represents, warrants, and covenants that it has the full legal power and authority to enter into this Agreement. 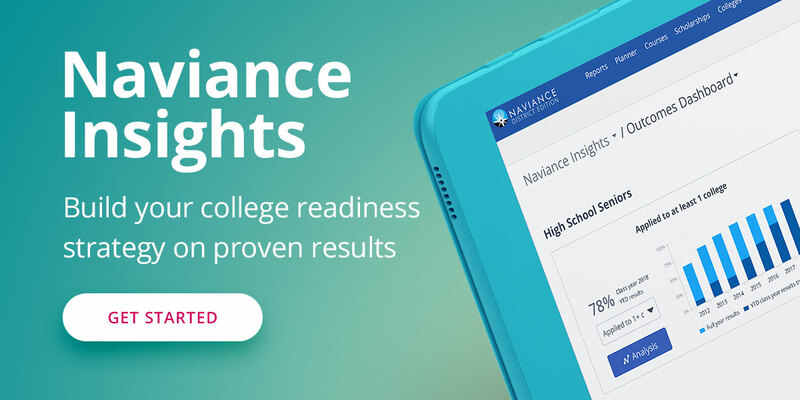 Naviance represents, warrants, and covenants that it will provide the Service in a manner consistent with general industry standards reasonably applicable to the provision thereof, and that the Service will perform substantially in accordance with the on-line Naviance help documentation under normal use and circumstances. Customer and Users represent, warrant, and covenant that they have not falsely identified themselves nor provided any false information to gain access to the Service and that they will comply with the terms and conditions of this Agreement. 10.1 Customer shall indemnify, defend, and hold Naviance, its licensors and each such party's parent organizations, subsidiaries, affiliates, officers, directors, employees, attorneys and agents harmless from and against any and all claims, costs, damages, losses, liabilities and expenses (including attorneys' fees and costs) arising out of or in connection with: (i) a claim alleging that use of Customer Data infringes the Intellectual Property of, or has caused harm to, a third party, or (ii) a claim arising from or alleging breach by Customer or Users; provided that Naviance: (a) gives written notice of the claim to Customer as soon as practicable; (b) gives Customer sole control of the defense and settlement of the claim (provided that Customer may not settle or defend any claim unless it unconditionally releases Naviance of all liability and such settlement does not affect Naviance's business or the Service); (c) provides to Customer all reasonably available information and assistance; and (d) has not compromised or settled such claim without Customer's prior written consent. 10.2 Naviance shall indemnify, defend, and hold Customer and its parent organizations, subsidiaries, affiliates, officers, directors, employees, attorneys and agents harmless from and against any and all claims, costs, damages, losses, liabilities and expenses (including attorneys' fees and costs) arising out of or in connection with a claim alleging that the Service directly infringes the Intellectual Property of a third party. Naviance shall have no indemnification obligation, and Customer shall indemnify Naviance pursuant to this Agreement, for claims arising from any alleged infringement related to the combination of the Service with any of Customer's or any of Customer's licensor's products, service, hardware or business process(es), so long as such use was not authorized or directed by Naviance, such authorization and/or direction having been given in writing. 11. Disclaimer of Warranties. (I) NAVIANCE AND ITS LICENSORS MAKE NO REPRESENTATION, WARRANTY, OR GUARANTY AS TO THE RELIABILITY, TIMELINESS, QUALITY, SUITABILITY, AVAILABILITY, ACCURACY OR COMPLETENESS OF THE SERVICE OR ANY CONTENT PROVIDED TO NAVIANCE BY CUSTOMER OR USERS; (II) NAVIANCE AND ITS LICENSORS DO NOT REPRESENT OR WARRANT THAT (A) THE USE OF THE SERVICE WILL BE SECURE, TIMELY, UNINTERRUPTED OR ERROR-FREE OR OPERATE IN COMBINATION WITH ANY OTHER HARDWARE, SOFTWARE, SYSTEM OR DATA, (B) THE SERVICE WILL MEET CUSTOMER’S REQUIREMENTS OR EXPECTATIONS, (C) ANY STORED DATA WILL BE ACCURATE OR RELIABLE, (D) THE QUALITY OF ANY PRODUCTS, SERVICES, INFORMATION, OR OTHER MATERIAL PURCHASED OR OBTAINED BY CUSTOMER THROUGH THE SERVICE WILL MEET CUSTOMER'S REQUIREMENTS OR EXPECTATIONS, (E) ERRORS OR DEFECTS WILL BE CORRECTED, OR (F) THE SERVICE OR THE SERVER(S) THAT MAKE THE SERVICE AVAILABLE ARE FREE OF VIRUSES OR OTHER HARMFUL COMPONENTS; (III) THE SERVICE AND ALL CONTENT IS PROVIDED TO CUSTOMER STRICTLY ON AN "AS IS" AND "AS AVAILABLE" BASIS; AND (IV) ALL CONDITIONS, REPRESENTATIONS AND WARRANTIES, WHETHER EXPRESS, IMPLIED, STATUTORY OR OTHERWISE, INCLUDING, WITHOUT LIMITATION, ANY IMPLIED WARRANTY OF MERCHANTABILITY, FITNESS FOR A PARTICULAR PURPOSE, OR NON-INFRINGEMENT OF THIRD PARTY RIGHTS, ARE HEREBY DISCLAIMED TO THE MAXIMUM EXTENT PERMITTED BY APPLICABLE LAW. 12. Internet Delays. THE SERVICE MAY BE SUBJECT TO LIMITATIONS, DELAYS, AND OTHER PROBLEMS INHERENT IN THE USE OF THE INTERNET AND ELECTRONIC COMMUNICATIONS. NAVIANCE IS NOT RESPONSIBLE FOR ANY DELAYS, DELIVERY FAILURES, OR OTHER DAMAGE RESULTING FROM SUCH PROBLEMS. 13. Limitation of Liability. In no event shall Naviance be liable to any Customer or User for any indirect, special, exemplary or consequential damages including, without limitation, loss of data, lost profits, in any manner related to the Service or Customer’s or any User’s use thereof based in contract, negligence, strict liability or otherwise, whether or not they had any knowledge, actual or constructive, that such damages might be incurred. The maximum liability for Naviance arising out of any kind of legal claim (whether in contract, tort, or otherwise) in any way connected to the Service shall not exceed the amount paid to Naviance by Customer or User for use of the Service. 14. Additional Rights. Certain states and/or jurisdictions do not allow the exclusion of implied warranties or limitation of liability for incidental or consequential damages, so the exclusions set forth above may not apply to Customers or Users. 15. Local Laws and Export Control. In this Section 15 (Local Laws and Export Control) only, 'Export Controls' means any export control and economic sanctions laws and regulations of the United States of America, the United Kingdom, the European Union (or any Member State thereof), the United Nations and each other jurisdiction in which Naviance is incorporated, operates, conducts business or to which it is subject from time to time, including, but not limited to:(i) the US Export Administration Regulations, the US International Traffic in Arms Regulations, the US Department of Treasury Office of Foreign Asset Control's economic sanctions regulations; (ii) sanctions programmes maintained by the British Government, EU regulation on the control of exports of dual-use items and technology and any applicable European Union restrictive measure that has been or is to be implemented pursuant to any European Council or Commission Regulation or Decision adopted pursuant to a Common Position in furtherance of the European Union's Common Foreign and Security Policy; and (iii) the Indian Foreign Trade (Development and Regulation) Act, 1992, the Indian Weapons of Mass Destruction and Their Delivery Systems (Prohibition of Unlawful Activities) Act, 2005, and notifications and Foreign Trade Policy issued from time to time by the Director General of Foreign Trade, Department of Commerce and Industry, Government of India. 15.1 The Service provides services and uses software and technology that may be subject to Export Controls depending on who uses them, for what purposes they are used and where they may be used. Accordingly, Customer undertakes and agrees that the Service shall not be used, and none of the underlying information, software, or technology may be transferred or otherwise exported or re-exported in breach of Export Controls. This shall include, but not limited to, Customer ensuring that the Service is not used, directly or indirectly, by a specially designated person or entity listed on the U.S. Department of Treasury's List of Specially Designated Nationals or the U.S. Department of Commerce's Table of Denial Orders or the European External Action Service Consolidated List of financial sanctions targets (collectively "Designated Nationals"). 15.2 Customer represents and warrants that it is not owned or under the control of a Designated National and the funds used to pay for the Service are not derived from a Designated National or an activity which would otherwise be in breach of Export Controls. If Customer uses the Service in breach of Export Controls, including using the Service as, for or on behalf of a Designated National, or reasonably suspects that such a breach has or will arise, then Customer shall immediately notify Naviance in writing upon which the Service may be terminated by the Naviance at its sole discretion in writing to Customer. 15.3 The Service may use encryption technology that is subject to licensing requirements under the U.S. Export Administration Regulations, 15 C.F.R. Parts 730-774 and Council Regulation (EC) No. 1334/2000. Naviance and its licensors make no representation that the Service is appropriate or available for use in other locations. Customer remains solely responsible for applying for and obtaining an appropriate licence for use of the Service if so required under Export Controls, including those controls applicable to Customer. Any diversion of the content contrary to US laws and regulations is prohibited. 16. Notice. Naviance may give notice by means of a general notice on the Service or by written communication or e-mail to the address of the primary contact for Customer or Users on record with Naviance. Such notice shall be deemed to have been given to Customer or Users upon the expiration of forty-eight (48) hours after mailing or posting (if sent by first class mail or prepaid post) or 12 hours after sending (if sent by e-mail). Customer or Users may give notice to Naviance at any time by letter delivered by a nationally recognized overnight delivery service or first class postage prepaid mail, by e-mail, or by fax to Naviance Inc., 3033 Wilson Boulevard, Suite 500, Arlington, VA 22201, 703-859-7319 (fax), legal@naviance.com, or such other address as may be designated from time-to-time. Such notice shall be deemed given when received by Naviance. 17. Modification. This Agreement may only be modified by the written agreement of both parties. 18. Assignment. This Agreement, including all rights and obligations hereunder, may not be assigned by Customer or Users without the prior written approval of Naviance. 19. General. This Agreement shall be governed by Commonwealth of Virginia law and controlling United States federal law, without regard to the choice or conflicts of law provisions of any jurisdiction, and any disputes, actions, claims or causes of action arising out of or in connection with this Agreement or the Service shall be subject to the exclusive jurisdiction of the state and federal courts located in the Eastern District of the Commonwealth of Virginia. In the event of any inconsistency between this Agreement and any purchase order or similar terms on any Customer form, this Agreement shall control. If any provision of this Agreement is held by a court of competent jurisdiction to be invalid or unenforceable, then such provision(s) shall be construed, as nearly as possible, to reflect the intentions of the invalid or unenforceable provision(s), with all other provisions remaining in full force and effect. No joint venture, partnership, employment, or agency relationship exists between Naviance and Customer or Naviance and Users as a result of this Agreement or use of the Service. The failure of Naviance to enforce any right or provision in this Agreement shall not constitute a waiver of such right or provision unless acknowledged and agreed to by Naviance in writing. This Agreement comprises the entire agreement between Naviance and Customer and Naviance and Users with respect to the Service and supersedes all prior or contemporaneous negotiations, discussions or agreements, whether written or oral, between the parties regarding the subject matter contained herein. Sections 6, 7, 9, 10, 11, 13, and 19 shall survive termination of this Agreement. 20. Professional Services. In the event Customer elects to receive professional services, including professional development and/or consulting services from Hobsons, Inc., the following terms shall apply. Customer agrees to contact Naviance prior to the session if Customer has any questions regarding these responsibilities. 20.1 Customer Responsibilities for Professional Development. All professional development sessions are hands-on sessions and require a computer for each participant. Customer must ensure that participants' computers are in good working order, that the appropriate hardware and software necessary to connect to the network provided in the training facility is installed, and that participants know how to connect the computer to a network. Customer must also plan to have no more than 15 individuals attend a training session at a time to ensure proper student to instructor ratio for effective learning. Customer agrees to work with Naviance to ensure that any professional development session purchased is conducted within 12 months from the date of purchase and acknowledge that a failure to have Naviance deliver a session within 12 months from the date of purchase shall constitute a cancellation by Customer as described in Section 20.6. 20.2. Customer Responsibilities for Consulting Services. With respect to consulting services, Customer agrees to the required preparation as outlined by Naviance to effectively start the engagement and utilize the services of the Naviance Consultant. Customer agrees to work with Naviance to ensure that all consulting hours purchased are utilized within 12 months from the date of purchase and acknowledge that a failure to have Naviance deliver consulting services within 12 months from the date of purchase shall result in a forfeit of the consulting hours purchased. With regards to Delegated Authentication, implementation of this service is the responsibility of Customer. The Naviance consultant cannot provide a SOAP-based web service or the technical support to create this service. With regards to automated data import, implementation of cURL is the responsibility of Customer. The Naviance consultant cannot install cURL, create a cURL directory or configure cURL for Customer. Customer understands that as part of providing certain consulting services as specified by Customer Naviance may have access to Customer’s student data in order to provide those services. Such access will be for the sole and limited purpose of providing Customer with information and analytics about Customer’s and its User’s configuration and use of the Services and progress within the Services, and to provide insights, recommendations and reports for the sole and exclusive use by Customer for its purposes. 20.3. Warranties. Naviance warrants that each of its instructors and consultants performing such professional services shall have the proper skill, training, and background to perform in a competent and professional manner. Such professional services may include unknown and unforeseen problems and Naviance shall attempt to resolve such problems, should they occur. Customer acknowledges that Naviance does not warrant that a satisfactory solution to all problems will be possible. 20.4. Payments and Refunds. Customer or a contact designated by Customer will be invoiced for professional development session(s) and consulting services at the time of purchase. If applicable, Naviance will invoice Customer for travel expenses incurred by the instructor(s) for any on-site professional development services and consultant(s) for any on-site consulting services. Payments are due in accordance with Section 3 and within the time frame stated on each invoice and all consulting services and professional development sessions are non-refundable except as a result of a request by Naviance to cancel or reschedule a professional development session as described in Section 20.5. 20.5. Cancellation or Rescheduling by Naviance. Naviance reserves the right to cancel or reschedule sessions. In the event Naviance cancels or asks to reschedule a session, Customer may choose to reschedule, attend another comparable session, or receive a full refund. 20.6. Cancellation or Rescheduling by Customer. Customer may reschedule an on-site or webinar session that has been previously confirmed by Naviance, provided that Customer agrees to: (a) notify Naviance in writing at least 3 business days in advance prior to the start of the session; (b) pay costs incurred on Customer's behalf for the session as originally scheduled (including but not limited to any cancellation fees paid to our instructor(s) and, if applicable, travel expenses), and (c) pay travel expenses associated with the session once rescheduled, if applicable. A session shall be considered canceled by Customer, with no further obligations by Naviance, in the event of any of the following: (a) failure to schedule a session to be conducted within 12 months from the date of purchase, (b) failure by Customer to attend a session for which Customer is registered without providing the specified advance notice to Naviance, or (c) failure by Customer to reschedule a session in accordance with the provisions of this Section. Customer agrees to pay any fees for services and to pay any expenses incurred by Naviance on Customer's behalf in connection with sessions confirmed by Naviance and canceled by Customer. If cancellation of a session is a result of inclement weather resulting in a school or delay, Customer is still responsible for paying any expenses incurred by Naviance on the Customer's behalf, however the session will not be considered cancelled by Customer. 21. Digital Millennium Copyright Act. The Digital Millennium Copyright Act of 1998 (the "DMCA") provides recourse for copyright owners who believe that material appearing on the Internet infringes their rights under U.S. copyright law. Naviance reserves the right to remove any material on the Service which allegedly infringes another person's copyright. If you believe in good faith that materials hosted by Naviance infringe your copyright, you (or your agent) may send us a notice requesting that the materials be removed, or access to them blocked. Such notice must meet statutory requirements imposed by the DMCA and must be in writing and include the following information in writing: (i) an electronic or physical signature of the person authorized to act on behalf of the owner of the copyright interest; (ii) a description of the copyrighted work that you claim has been infringed. Please describe the work and, where possible, include a copy or the location (e.g., URL) of an authorized version of your work; (iii) a description of the material that you claim to be infringing, as well as its location within the Service; (iv) your name, address, telephone number, and e-mail address; (v) a statement by you that you have a good faith belief that the disputed use of the materials is not authorized by the copyright owner, its agent, or the law; and (vi) a statement by you, made under penalty of perjury, that the above information in your notice is accurate and that you are the copyright owner or authorized to act on the copyright owner's behalf. If you believe in good faith that a notice of copyright infringement has been wrongly filed against you, the DMCA permits you to send us a counter-notice. Notices and counter-notices for the Service should be sent to: Matthew S. Kelman, Esq., 46 Southfield Avenue, Suite 400, Stamford, CT 06902. We suggest that you consult your legal advisor before filing a notice or counter-notice. Also, be aware that there can be substantial penalties for false claims.